Alvarez showed skill and durability to outlast Golovkin in another attritional contest between the two evenly-matched rivals. Mexico’s Saul “Canelo” Alvarez ended Gennady Golovkin’s unbeaten reign as unified middleweight champion here Saturday, battling to victory by majority decision in a pulsating rematch. Alvarez inflicted the first defeat of Kazakh slugger Golovkin’s career after two judges scored it 115-113 in his favour, with another judge scoring it even at 114-114. “I am a great fighter, and I showed it tonight,” said Alvarez, roared on by a partisan crowd throughout on the eve of Mexico’s Independence Day celebrations. Golovkin, who fell to 38-1-1 after the loss, left the ring immediately to get eight stitches to a cut above his right eye. He later said he believed he had done enough to win — and opened the door for a possible third instalment. “I’m not going to say who won tonight, because the victory belongs to Canelo according to the judges,” the deposed WBA, WBC and IBO middleweight king said. Alvarez’s victory ended the 36-year-old’s dream of securing a record-breaking 21st consecutive defence of his middleweight titles. While Golovkin appeared to take issue with the result, there was little sense of controversy about Saturday’s outcome. Golovkin’s trainer Abel Sanchez was among those who had few complaints. “I had it close going into the 12th round,” Sanchez said. “We had good judges who saw it from different angles – I can’t complain about the decision, but it’s close enough to warrant a third fight. The Mexican, who had been accused of “running” in the first fight, came forward relentlessly and dominated the mid part of the fight. 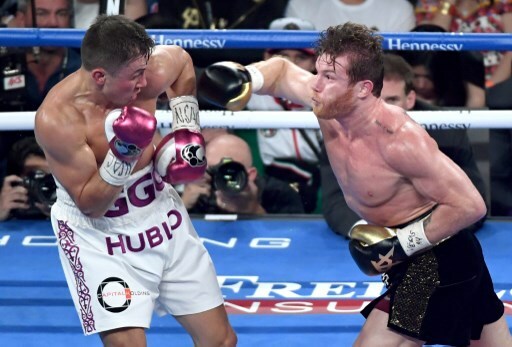 But Golovkin was never able to press home his advantage, and each time Alvarez was able to evade the looming danger to slide away and respond with blows of his own. Although statistics afterwards showed Golovkin had thrown more punches, it was Alvarez who landed more consistently, outscoring his rival 143-116 in power punches. The contest followed an acrimonious build-up which saw both camps trade insults in the wake of Alvarez’s two failed drug tests in February which forced the cancellation of an earlier May 5 rematch. The two boxers needed to be separated at Friday’s weigh-in after Alvarez charged at Golovkin as they faced off. However Golovkin had infuriated the Alvarez camp by repeatedly rubbishing his opponent’s explanation for the test results, accusing the Mexican of being a dope cheat. The acrimony was forgotten in the aftermath of Saturday’s bout, with both men embracing in the ring.